Despite demands by US that Iran withdraw forces from Syria, Tehran signs deal with Assad regime, vows to continue military cooperation. Iran vowed to continue its military cooperation with the Assad regime, signing a deal with the Syrian government on Monday, in defiance of calls for Tehran to withdraw its forces from Syria. The deal was inked a day after Iranian defense minister Amir Hatami arrived in Damascus, as the two powers gear up for a large-scale campaign in the Idlib province in northwestern Syria. Hatami rejected calls by the US and Israel that Tehran withdraw its Quds Force from Syria. 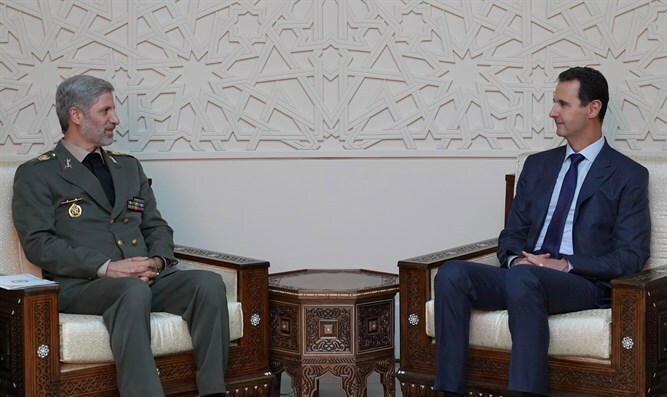 On Monday, Iran and the Assad regime formalized their understanding regarding Iran’s involvement in Syria, signing a deal cementing Iran’s ‘cooperation’ with the Assad government. "Syria is passing the phase of crisis to the phase of reconstruction and as a result, the signed agreement will define the areas of presence, contribution and cooperation between Tehran and Damascus," Hatami said, according to a report by Mehr. According to a report by the Lebanese media outlet Al Mayadeen, a Hezbollah mouthpiece, Hatami said that Iran will work to rebuild Syria’s military, as well as its arms industries. The Russian media outlet Sputnik cited a senior Syrian official, who stated that Monday’s deal was drafted in part in response to pressure by Israel and the US to force Iran out of Syrian territory. Both the US and Israel have urged Russia to back the demand, seen as being key to Israel’s security, but have yet to win clear backing from the Kremlin. During his meeting with President Donald Trump in Helsinki last month, President Vladimir Putin reportedly expressed support, in principle, for the removal of Iranian forces from Syria.